Studio Mule presents Yoshimi Ueno's Taiko No Uminari, originally issued in 1980 on Johnny's Disk Record. Johnny's Disk Record is an independent jazz label run by the owner of jazz cafe Kaiunbashi No Johnny, located in Rikuzentakata City in Iwate Prefecture, Japan. The legendary label released a string of albums of high quality but down-to-earth music, spanning from modern and avant-garde jazz to left-field pop, many of which have reached cult status among fans as some of the best works to come out of the Japanese jazz scene. Taiko No Uminari is the only solo record drummer Yoshimi Ueno released before passing. 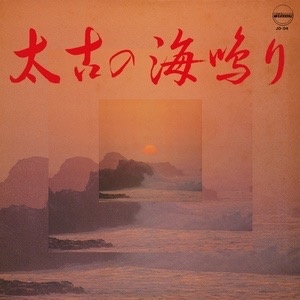 The album features "Sea Sound", a hard bop number with soulful melodies and impressive saxophone playing by Yasuaki Shimizu, the folky and melancholic "Tsuchi Ningyo", composed by labelmate Nakayama, the romantic ballad "My Spirit" by pianist Keisaku Takahashi, poly-rhythmic jam "Skip" written by Ueno himself, "K.Blues", a bluesy tune with a bit of a New Orleans jazz vibe, and "Uzushio," a duet between Nakayama's bass and Ueno's drums. Edition of 500.